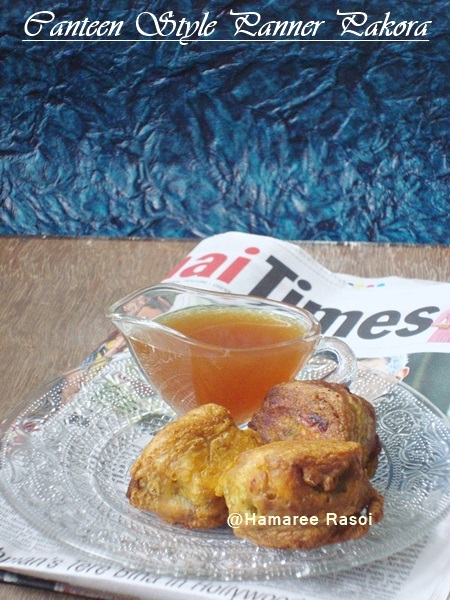 There was a time when we were in school and during breaks in canteens we used to watch teachers sit and gossip with a cup of tea and pakoras bought from there. As we did not get so much pocket money those days so we had to be satisfied with the good old lunch box. However, that never was a dampener for my liking of the pakoras. And as time passed, by the time I was in college and could afford pakoras, they were not as tasty as the ones in school which I used to have very rarely that too after pooling pocket money for weeks. 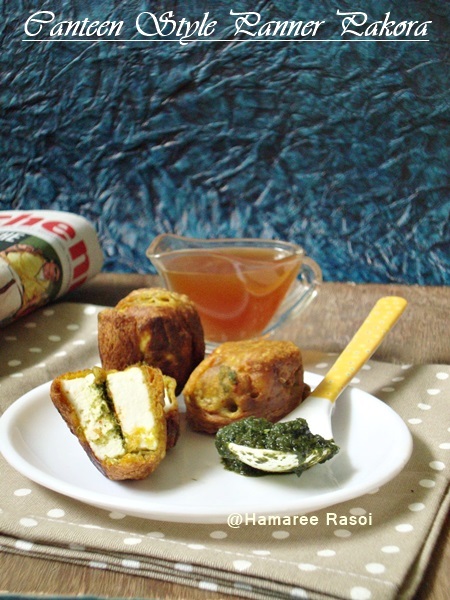 Paneer pakora is a tasty appetizer and goes fabulous with Masala Chai. Sprinkle some salt, turmeric, red chilly powder, ginger paste and corn flour over paneer pieces, mix well and leave aside for 15 minutes. Prepare the batter by adding besan in a bowl, make a well in the center and add garam masala powder, ajwain, some salt and baking soda. Add enough water to make a thick paste. In the meantime heat oil in a deep pan. Assemble the paneer sandwich by applying Green Chutney on one side of a paneer piece and place another piece on top of it. Dip each sandwich paneer piece in the prepared batter and deep fry on medium flame till it turns golden and then drain it on kitchen towel. Fry all paneer sandwiches in batches. Transfer these to serving plate and serve with Green chutney or with ketchup. 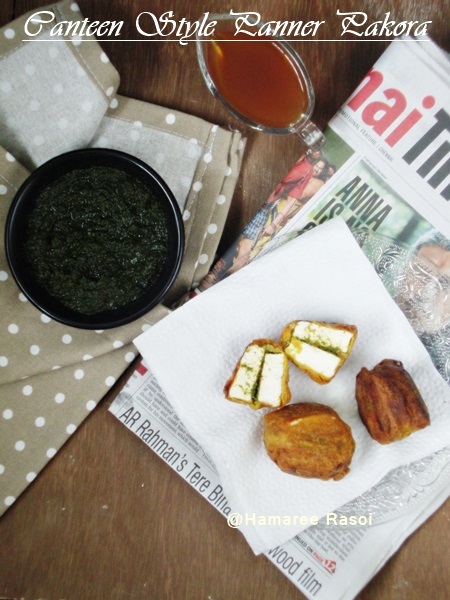 You can easily skip green chutney and make single layer paneer pakora. 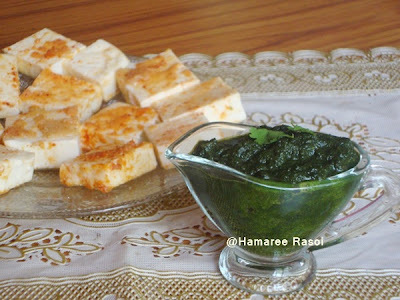 Homemade paneer also works fine. PAneer pakora looks yumm. Dekhei khete ichha korchhe koyekta parcel kore amake pathiye dao. Pakoras looks tantalizing,will do anything for a bite. A wonderful snack, looks so delicious! As you said,it does look like canteen style pakoras. thanks for sharing this recipe deepa.. never tried this..
Omg, paneer pakoras looks seriously fabulous, i can have a plate full of pakoras rite now. Lip smacking snack, looks so tempting!